I personally believe in soul contracts, but just like any other contract: they have an expiration date and they can be broken at one’s will, because at the end of the day, they are just a piece of paper. Of course, the emotional weight we place in things like “blood bonds”, marriages and friendships makes it harder to see it that way, but it is only because we are attached to the ideas and institutions of these bonds. When things start “falling apart” with someone you interact with constantly, it is these attachments what prolong the ending, rather than the actual person. Although some people will find it really hard to be “let go of”, when one has clear boundaries, and after their bargaining stage, they will be on the path of freedom too. What is the purpose of a soul contract? In the case of relating to someone who actually brings you joy and new experiences, well it’s growth and celebration. They say we meet three types of people, people who are where we were that remind us of the struggles we overcame and the things we conquered while transforming into a higher version of ourselves, then there are those who we meet at our current state who share the same insights, struggles, intentions, etc, and lastly, we meet people who are beyond our current state and serve as a mirror to go beyond our current limitations. These last ones are the people that inspire, motivate and serve as inspirational characters very much like in TV, when they choose an “older” character who is a symbol of wisdom, freedom and success per se. In the case of relating to someone who is a walking challenge to relate to, it’s also for growth and empowerment. Unfortunately we cannot learn to be respected, unless we are constantly disrespected, we can’t learn about discernment if we are not constantly submitted to lies, we can’t learn about boundaries unless we are constantly pushed, abused and manipulated beyond our own limits for something outside of ourselves (another person). Luckily, the good news is that once you get this, you can call it quits for good and choose people that are more aligned with you, because it is only up to you how long you stay in a destructive situation. Do I believe the people that are walking messes, are really good people “on the other side”? I don’t know and I don’t care, I am here to serve as a rite of passage assistant and there is too much interference from the spirit world to be bold enough to say: Everyone is pure light, simply playing a part. And I know for sure some people are carrying heavy stuff and not-so-good entities. Point is, I’m not an advocate for abuse and my goal is to bring upon a clearer notion of self-love. So yes! You can get out, even after 5, 10 or 20 years, you are not stuck with the people that keep you in a loop of the past, repeating the same offenses. When you are truly conscious of the lesson and forgiving comes natural then you will do it, in your own time, not because you are on a race of proving yourself you are always “the bigger person” or the saint. If there’s one thing I have learned on my journey on this Earth is that wholeness is much more important than social approval, things take time to build, destroy and process and it is an individual process. 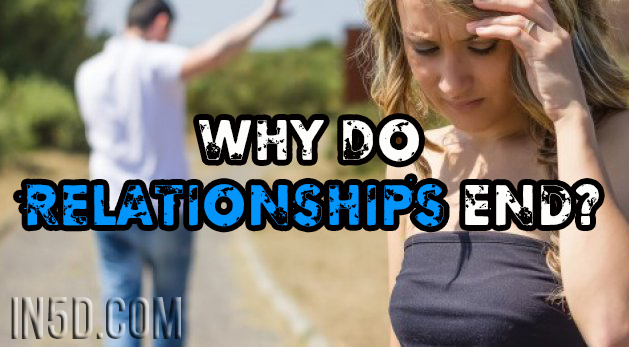 So why do relationships end? You are sitting in the same room but in completely different universes. Apart from learning what you needed to learn with the other person, you get fed up. Fed up with this “older” version of you right up in your face all day and you are over the “constant reminder” and conditioning. An “older version” of yourself is the person you WERE when you married them but now you grew other interests and views on life. The person you WERE when you let everyone walk all over you. The person you WERE when you went to the wrong people for compassion and found yourself more alone than ever. The person you WERE when you were exploring a given subject which you have lost interest in. The person you WERE when you expected others to fill your needs while never knowing that you could do it on your own, that you could trust your own judgment and most importantly, that you mattered, whether other people could see it or not, whether other people knew it or not. So these conflictive people, reflect back at you the ways in which you limited yourself in the past and what no longer resonates for you as a way of life. This is why often times we use the expression: “You changed!” It’s like the direct confirmation that we know we are different, that the projection has been integrated in the self and no longer needs the other person to mirror it and hence the other person literally feels: “He/she doesn’t NEED me anymore”. In simpler and more human terms, there are some giveaways as to why things end. There are evidences of power struggles, conditioning the other one’s will through manipulation, tactics, strategies, blackmailing, guilt tripping, gaslighting and they finally see the game and won’t take it anymore. These are not limited to lovers, but work partners, family members, institutions, friends and acquaintances. There are clear references of disrespect, lack of consideration, disharmony, broken communication and lack of empathy that started to take a front seat in the relationship. And then there’s other protocols that express “being fed up” like cheating, addiction, withdrawal and rage. Despite the signs, most relationships don’t die a natural death, this is due to two things: justification and victimization. The person being let go off will resist the “being let go off” by victimizing themselves, with threats, tears, reproaches and whatever is available to them to play that last card and we have all heard those “If you leave I will kill myself”, “If you leave, you will never see your kid again”. When it comes to the justification part which prolongs the ending of a relationship, I have seen it mostly in those that are letting go of the other person. They will often explore in their minds “I can’t just leave, maybe they aren’t as bad as I think they are, they are suffering too”, and in the case of the “victim” using justification they will think: “Oh, he/she is changing because they are trying to find themselves again, in the meantime I’ll just give them full control of my life and wait until they decide if they want me or not”. True story, there’s a great song that supports that from Martina Mc Bride: “How far do I have to go to make you understand I want to make this work so bad it hurts, but not until you decide what you want what you need, do you even care if I stay or leave…”. Cheating in a sense, is too a soul contract with a third person to break apart what is no longer working. It’s like two people were going to find it very challenging to leave each other, despite of the fact that they had outgrown their relationship and were no longer good for each other, and the extra person sways one away into freedom and the next stage of their lives. Since cheating will not be sustainable for either party on the path of growth, self-love and self-respect, the wild card person will eventually lead the way for the breakup. Some stay with their lovers while others find the freedom to become single again and work on other aspects of their life they had delayed, due to the drain their relationship provoked. Ultimately we all want to be happy and if we don’t know what that is, we surely want to find it. As much as there is some people who thrive on conflict, there are some of us who want peaceful existences and we don’t have to put up with the drama. So when you find less and less things in common with a person, when you find you have to “play a part” while in their presence, when you have to select what aspects of yourself to share as to not scare them away, when they stack you with roles and duties you have to fulfill, when your dreams start drifting away and squashed by senseless routines, when your wings are feeling trimmed with each corner of the house you walk into, when they only share their problems with you, when you only find comfort in being by yourself, when your beliefs are always crashing with theirs, when you want to travel and they want to build a home, when you want children and they want adventure…maybe, just maybe it is time to stop justifying all the differences for the-sake-of-good-conduct and let life take the course of letting you go of that person, that person who embodies and represents a structure you no longer see fit for your own life. Relating should not be hard, when it is, there is something to learn, or a choice to not struggle in it either by settling for less than greater connection and intimacy or walking away, despite a past, the conditioning and all the tricks it took for you to stay so long, in a situation that was not good for you. This way, they too can find something more aligned to them and this is how it works both ways, despite villains, victims and heroes. Republished with permission from author.